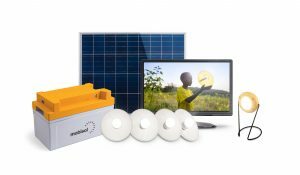 Warranty Information: A 3-year warranty on the PV panel, solar battery, Mobisol solar controller, Mobisol software, switches, and cables and lights, and 2 years on DC TV and antenna. Other Information: This is a family of products that includes all systems and components listed on the Specification Book. Pay-As-You-Go (PAYG) option available.